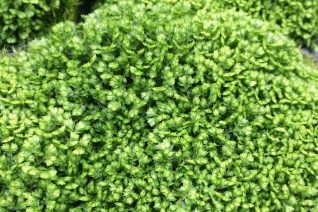 We love this fantastic dense growing acid green moss. It finds its best home in containers- not quite tough enough for life in the ground. Slowly expanding rounded dense clumps are beautiful all the time. Excellent as the understory to potted plants where it inhabits the most constrained roots with no problem. To 3″ x 6″ in a season. Very easy container plant. Regular water in rich, well drained soil. Regular water. Smooth and modern. 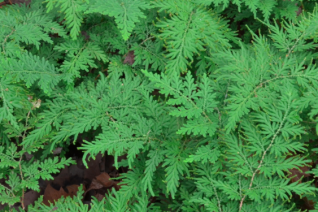 Arborvitae fern, but it isn’t a fern at all! Actually its a really big spike moss! A moss with stems and arrow shaped fronds like a fern. To 10″ tall and forming a mounding colony in time. Bright green summer color is replaced by russet red and light brown with winter cold. Spreads slowly underground and new “fronds” unfurl out and up. With great age you’ll get a decent patch. So damn pretty for woodlands in the shade in rich, well drained soil that retains moisture. Regular summer moisture. Slow and easy does it. Its a moss! Can you dig it? Evergreen. 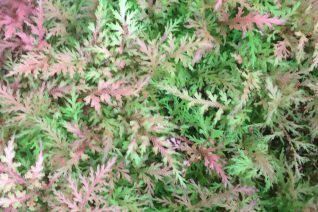 Funny little spike moss that forms an upright clump of acid green to ochre foliage that turns bright russet red and pink in cooler weather. 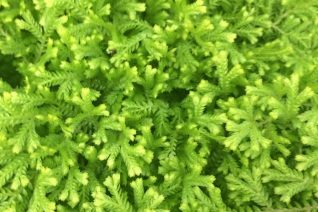 This moss is actually easy to grow in rich soil in a woodland with regular moisture. Forms little new platelets at the leaf tips and they drop off an wah lah new plants. Thrives in containers. Protect from blasting sun and avoid total drought. They thrive in the most humid atmosphere you can find. Near a pond margin or in the spray zone of a waterfall. I even mist mine mine in the ground when it gets over 90ºF for an extended time. Mosses are cool. To 6″ x 6″.